The development of a device for marine renewable energy conversion involves the use of different analysis tools and different levels of complexity and detail. 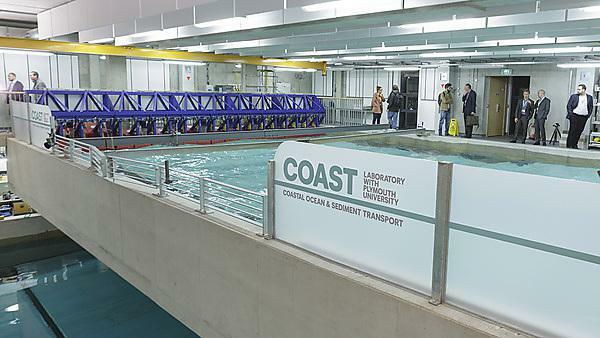 Wave tank testing gives insight into the behaviour of a marine energy converter (MEC) and can be carried out at different scales and at different stages in the design in order to assess the concept, optimise the design and validate numerical models. Numerical modelling is carried out alongside wave tank testing. It is a cheaper alternative, giving potentially high density of data, but with known limitations in terms of spatial and temporal resolution. Both wave tank testing and numerical modelling are important tools in the development of a MEC device as well as in the design of a Marine energy farm, and are used to test layout and efficiency before going to the expense of full scale deployment. The new wave tanks at the University of Plymouth will be a major resource for the offshore renewable industry. In this project, a full numerical model of the wave tank will be developed that incorporates the wave makers, raisable floor, curved beach as well as pumps and ducting for the recirculating currents. The numerical model will be developed using a fully nonlinear computational fluid dynamics method, such as OpenFoam. It will allow reproduction of all features of the physical wave tank, including multidirectional wave generation and currents both longitudinally and transversely across the tank. The model will be developed to reproduce conditions at the WaveHub site provided by the field data measurements from the HF Radar and wave rider buoys deployed there. Analysis of this data will provide wave maker control input signals for the physical wave tank and also wave input boundary conditions for the numerical model. The model will be applied to case studies using real data from WaveHub field measurement and wave tank testing of combined wave and current interaction with a MEC device. This PhD is funded through the INTERREG Project MERIFIC, Marine Energy in Far Peripheral & Island Communities, and the student will join a team of UK and French partners. The aim of MERIFIC is to advance the adoption of marine energy across the two regions of Cornwall and Finistère, and the island communities of le Parc Naturel Marin d’Iroise and the Isles of Scilly. The MERIFIC research team is working collaboratively across technology support, policy issues, sustainable economic development and stakeholder engagement.